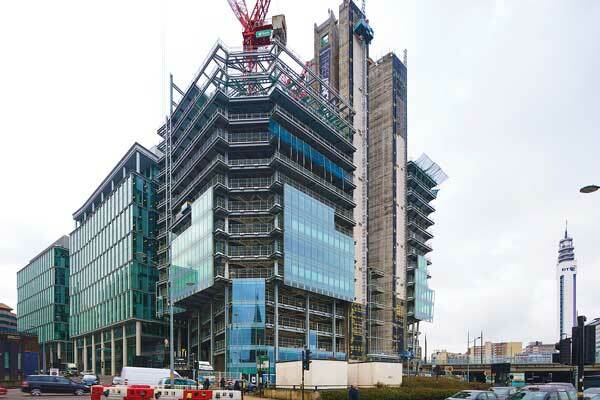 The third of three steel-framed office blocks in Snowhill, Birmingham, is one of the UK’s largest speculative office developments to be constructed outside of London. Martin Cooper reports. Steel tonnage: 4,500tSat next to its sister buildings One and Two Snowhill [see NSC January 2008 and September 2012], Three Snowhill is a 19-storey office tower that forms a stunning gateway to the city’s business district, completing the final phase of Ballymore’s Snowhill Estate development. Offering nearly 38,000m² of BREEAM ‘Excellent’ rated Grade A office floor space, together with retail and leisure units at podium and ground floor levels, the building sits atop four levels of concrete basement and podium substructure. Three Snowhill, like its sister buildings, has a composite design comprising a steel frame, with cellular beams supporting metal decking. As well as accommodating the office block’s services within the structural void, the Fabsec cellular beams have proven to be a cost-efficient option to create 10.5m-long internal spans. This final plot of the Snowhill development has a long and varied history as initially twin residential and hotel towers, both constructed with reinforced concrete frames, were envisaged. In 2007 work began on this scheme and all of the basement and substructure work had been completed when the job was halted a year later. Due to market conditions, a redesign was undertaken and the project was resurrected as a solitary commercial block, which in turn led the team to choose a steel framing solution. Instead of two main cores, one for each tower, the new scheme now has three concrete cores, which provide the stability for the single tower. Two of the cores, situated along the north elevation have the functionality of one core but are structurally independent. 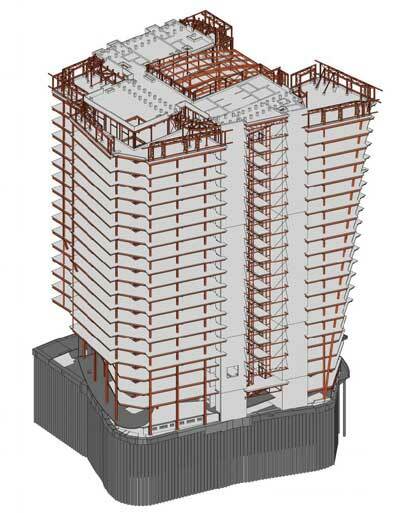 They are however linked together by steelwork that forms a frame for scenic lifts and a large glazed façade. Working on behalf of main contractor BAM Construction, Severfield has fabricated, supplied and erected some 4,500t of steel for this project. 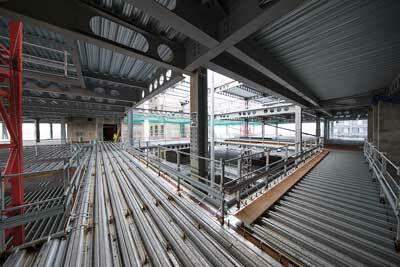 All of the steelwork has been erected via the site’s three tower cranes, as none of the elements exceed 13t in weight. Although the project sits on a busy inner-city area, it is well served with two material laydown areas, running along two main elevations, which have allowed steelwork to be delivered on a regular daily basis. While the city centre location has provided challenges with logistics, Severfield worked very closely with the site team to co-ordinate deliveries. Using its offload system has proved particularly useful, allowing the unloading of two steel deliveries at one time despite the tight conditions on site. The building wraps around a large central atrium, which allows plenty of natural light to penetrate the building’s inner areas as it is topped with a glazed roof. This glazing also spans over the double-height upper floor, creating a large light-filled breakout space. A series of steel CHS trees, each with either two or three branches, along with CHS rafters support the glazed roof on this upper level. Large parts of the building’s roof support plant areas and, in order to create a visual screen to hide the equipment, two elevations have a 5m over sail. This high-level element is formed by a series of cantilevering trusses. Possibly the most standout feature of the scheme are the raking façades which, as well as providing the building with some architectural highlights, help the project to maximise the available floor space as the building’s floorplates gradually increase as one ascends towards the uppermost floor. The building’s north west and north east corners both feature raking façades, formed by a series of CHS columns, founded at basement level on large 5m-high steel nodes. 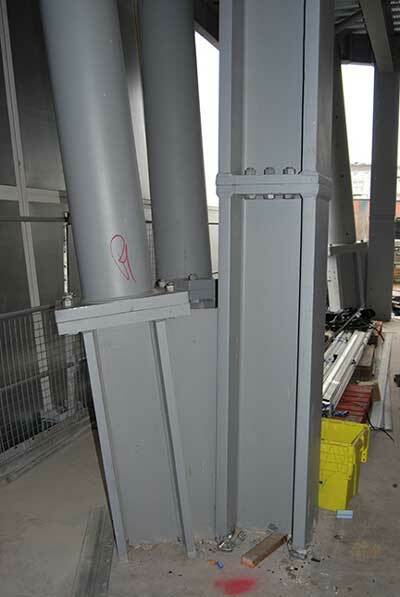 The nodes have bolted connections to the raking columns, which merge at the ground floor level, and to perimeter perpendicular columns. Weighing approximately 9t each, the nodes are either connected to two or three columns, depending on their location. Another sloping façade is located on the south east corner, where a portion of the building, extending from level three to eight, is suspended from three large raking columns. 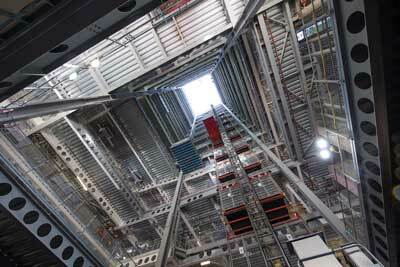 “Severfield’s design department has been key in developing solutions to issues such as the hung steelwork on the south east elevation, which had to be temporarily propped before it was fully suspended,” says BAM Senior Site Manager Charlotte Owen. Summing up the benefits of the steel-framed design, Ms Owen adds: “The steelwork frame installation sequence has allowed us to maximise programme benefits for following trades. For example, the floorplates being split in to four areas allows us to concrete the floors in two halves and then start installing the curtain walling, while still ensuring exclusion zones are maintained for the steelwork erectors. 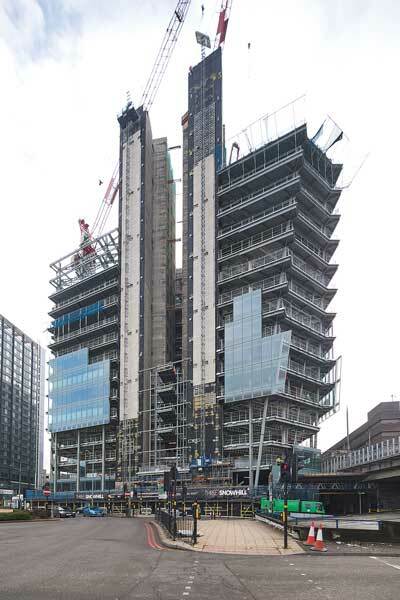 Three Snowhill is due to complete by Spring 2019.